The Know Your Customer (KYC) process for the IDAP crowdsale is now open! Please note that completing the KYC is mandatory if you wish to participate in the public token sale of IDAP. With the long list of participants who’ve signed up (28k+ and counting), preference will be given to those who complete their KYC fast. 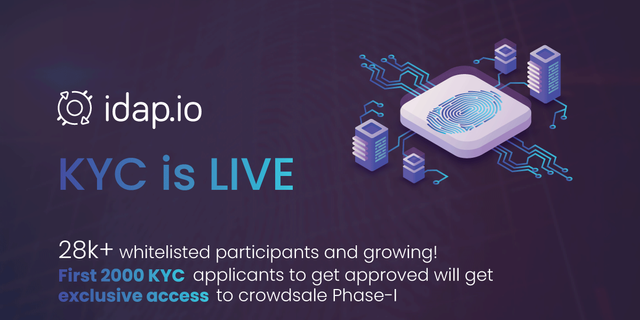 Hence, only the first 2000 applicants whose KYC is approved will be able to participate in first phase of the IDAP crowd sale. 1.Visit https://tokensale.idap.io/signin and sign in to your account. In case you have not whitelisted yourself, sign-up with a valid email-id. Once you’ve signed in, you have access to your Dashboard. Click on Submit KYC Documents. If you are not a citizen, resident or green card holder of the US (nor a citizen, resident or a person located or domiciled in an area/country that restricts ICO participation), click on the checkbox. Then click on the Start button to proceed. Fill in all the information needed to complete the fields as shown below. Once you have filled in all the appropriate fields, click on continue. Select the type of document you wish to submit. Upload a scanned copy that is no larger than 5 MB in size in one of the appropriate formats (.jpg, .jpeg, .png or .pdf). Finally, upload your selfie where you’re holding up your ID document and click on submit. With this, your end of the procedure is complete. Your KYC status will be updated once your information and documents have been reviewed. Please ensure that all your information and documents are up to date. Any discrepancy will lead to your application being rejected. Please ensure that the scanned copy of your ID document is high resolution with all its information visible clearly. Please ensure that in your selfie, both your face and the ID you’re holding are well-lit and clearly visible. You will be notified on the status of your application within 2 business days so please be patient. Mail us at support@idap.io in case of queries. Now that you know what to do, why wait? Complete your KYC now and add to the lucky list of 2000 participants who get exclusive access to IDAP crowdsale’s Phase-I!